This heart lesion was an autopsy finding in a girl of 16 years. There is a row of small, firm, greyish vegetations along the contact line of the mitral valve cusps. In places the vegetations have fused to form a continuous ridge. The vegetations have occurred at a site of minor trauma, where the valve cusps come into contact each time the valve closes i.e. on the contact line (not the free edge of the valve). The rheumatic vegetations or verrucae arise due to inflammatory erosion of the valve surface, followed by platelet and fibrin precipitation. They are the cardinal feature of rheumatic endocarditis. But endocarditis is just one component of the pancarditis that occurs in acute rheumatic fever, i.e. 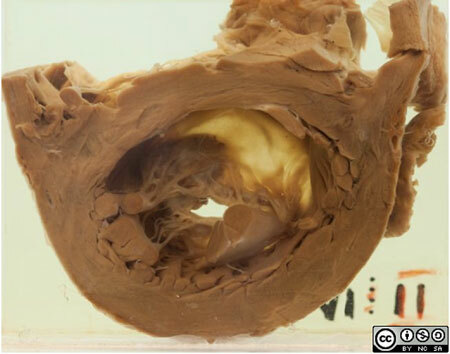 there are inflammatory changes in all three layers of the heart, endocarditis, myocarditis and pericarditis. 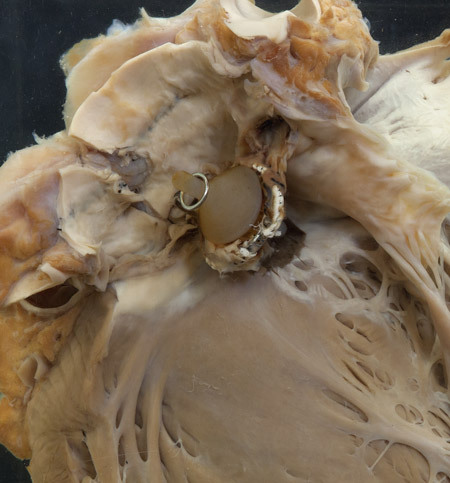 Aside from the visible rheumatic vegetations, the anatomy of the heart and the mitral valve is normal at this stage. 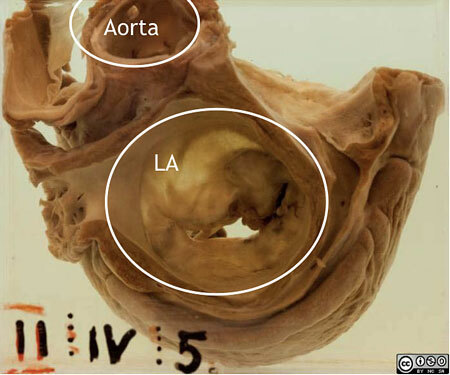 The heart has been opened in a vertical plane through the left atrium and ventricle. 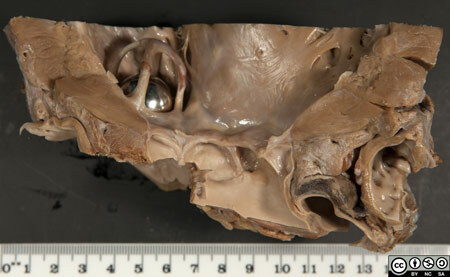 The mitral valve ring has been opened and flattened out horizontally. Note in particular the normal delicate chordae tendineae and the papillary muscles. In chronic rheumatic heart disease (RHD) the inflammatory lesions in the heart undergo organisation and fibrosis. Recurrent episodes of rheumatic fever cause cumulative damage. In particular, the valves become scarred and distorted, affecting their function. Clinical signs of the valvular and other cardiac damage may take years or decades to appear. 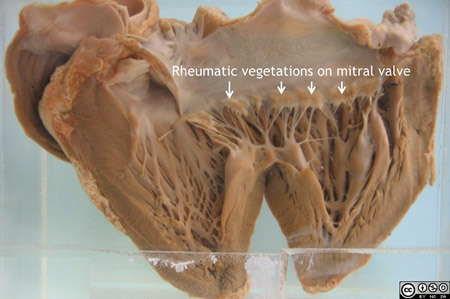 99% of cases of mitral stenosis are attributable to RHD. In a significant number of cases the acute phase of rheumatic fever goes unnoticed. This patient was a white man aged 38 years. He had no previous history of rheumatic fever. He presented with swelling of the abdomen for one month. He had also noticed breathlessness and palpitations. On examination he was orthopnoeic. There was oedema of the legs and scrotum. His pulse was very rapid and totally irregular. The heart was enlarged with an early diastolic murmur in mitral area. The liver was greatly enlarged. Signs of cardiac failure worsened and the patient died as a consequence. 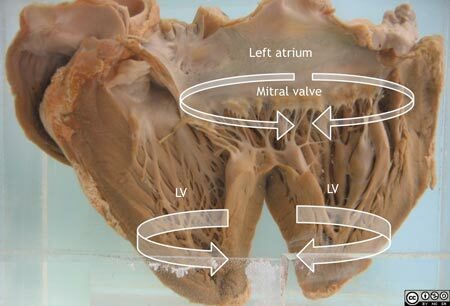 A cross-section of the left side of the heart, viewing the left atrium from above. 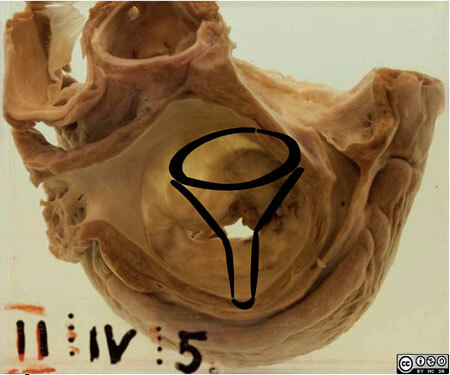 The mitral valve curtains are adhesed, thickened, distorted and calcified, resulting in funnel stenosis. 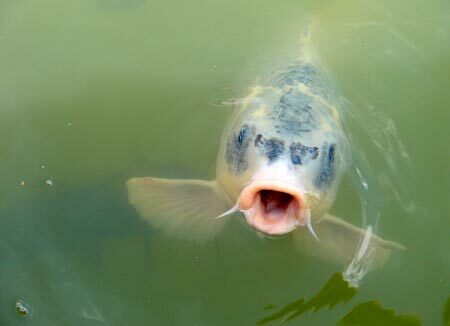 The orifice is narrowed to a typical “fishmouth” or "buttonhole”. 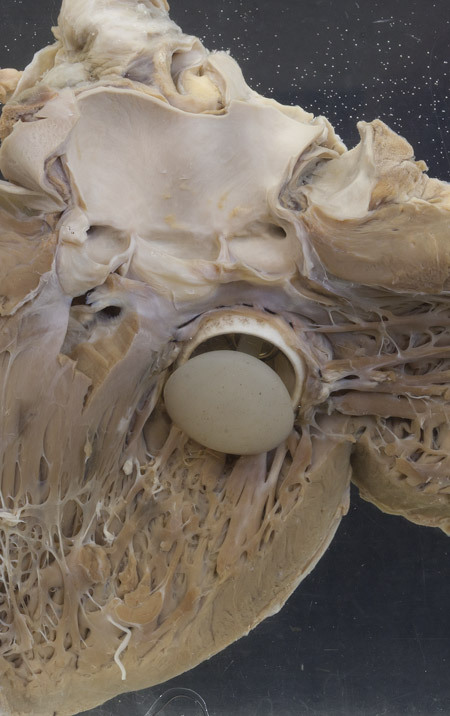 Here is the transected left ventricle, viewing the abnormal mitral valve from below. 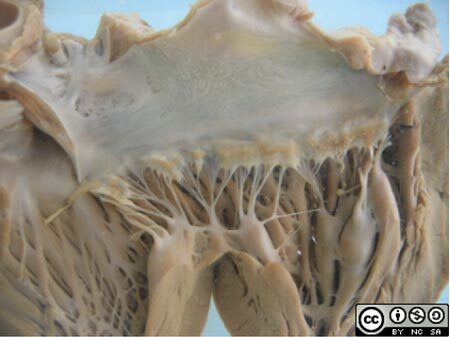 The chordae tendineae are also thickened and retracted (shortened) by fibrosis. The consequences of valve damage are heart murmurs, cardiac hypertrophy and/or dilatation and cardiac failure. Other complications are arrhythmias, thromboembolic events (such as stroke) and infective endocarditis. Note that our 2 cases date from the 1920’s and 1930’s. 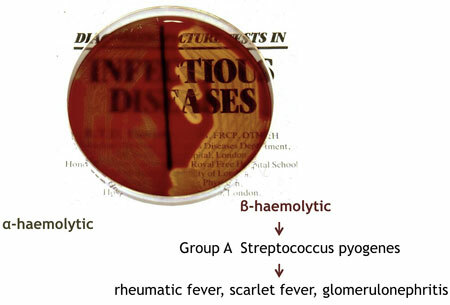 At this time the link between streptococcal sore throat and rheumatic fever was recognised but not fully understood. Penicillin prophylaxis to prevent (recurrent) attacks of rheumatic fever only came into use after World War II. Life-saving valve replacement surgery was only developed in the 1960’s. Currently, approximately 150 rheumatic valves are replaced each year by the cardiothoracic surgery unit at Groote Schuur Hospital.